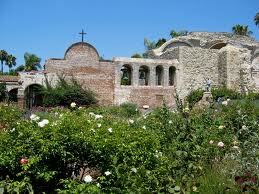 Mission San Juan Capistrano was founded 1 November 1776 (7th in order) by Blessed Junípero Serra. The mission is named for Saint John of Capistrano, Italy. The Indian name was Sajirit or Quanis-savit. Nicknamed “Jewel of the Missions” San Juan Capistrano is perhaps the most famous because of the swallows that arrive mid-March (19 March – Saint Joseph’s day is the traditional arrival date) and stay until Mid-October. This activity has been documented since 1777. While much of the mission has been destroyed a small chapel, thought to be the oldest church in California, is called “Father Serra’s Church”. The chapel is active and has been since the mission’s founding. The mission is just off of Interstate 5 in San Juan Capistrano. From either direction on I5 take the California 74 exit (Ortega Highway and/or Camino Capistrano). Proceed West about a third of a mile to the mission at 31522 Camino Capistrano (California Landmark 200).